Cambridge Windsurfing is a group of people who love to windsurf, and try to do so at almost any opportunity, rain or shine, wintry mornings or sunny afternoons (we try to go for the second option but aren’t unknown to go out in the first). We are a strong and active section of the Club, with Half Blue status. A 1st (Blues) team and a 2nd team contest the Varsity Match with Oxford each year. Well, windsurf mostly, especially in Michaelmas and Easter term (Lent is a bit cold even for us). We also meet up for a drink most weeks and love a good societies swap. In the Easter break we get together with the Oxford windsurfers and go off somewhere sunny, windy and warm for a week of honing our skills and falling off in entertaining ways. For the last few years this has been Fuerteventura in the Canaries – but we are happy to travel to anywhere there is wind. On the Tuesday of May Week there is the legendary Cuppers inter-college windsurfing and sailing competition plus BBQ at Grafham Water. We love to have beginners with us and lots of people in the club are very happy to teach others. Windsurfing is fantastic fun and we want to share it with anyone and everyone so we run special trips for beginners, especially in October at the beginning of the Michaelmas Term and after exams in the Easter Term, when we encourage everyone to come along for a try on a nice warm sunny day (we hope). As well as this, for our Easter trip abroad we get some great instruction from world class windsurfers and it’s a great way for beginners to get started or to improve their skills. If you’re the observant type you may have noticed that Cambridge isn’t a lake and tourists don’t have to swim down King’s Parade, so instead we windsurf in several other places. About 40 minutes drive away is Grafham Water, great for learning and on a windy day you can really blast along. Each term we head off to one or two events organised by other universities and the SWA – including the famed Aussie Kiss in Devon each October. We have a kit store, a veritable Aladdin’s cave of windsurfing kit (including some great beginner gear) from which we grab a trailer full of stuff for a day or weekend out. As you might have guessed from this, we do need as many car-owning members as we can get. So, if you do have a car, we are delighted to have you. If this all sounds good to you, best way to get into contact with us is to use use the form on our Get In Touch page to add yourself to our mailing list. Also look out for us at the CUCrC stands at the Freshers Fair, underneath the CUCrC burgee banner or by the board and rig outside on Parkers Piece. To Join the Club is £50 for the whole year, allowing you to come on any trip with us (although we do ask you chip in for fuel – around £5 for a return trip to Grafham). 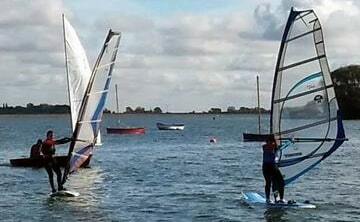 Your membership also allows you to take part in CUCrC kitesurfing, dinghy sailing and team racing should you wish to. Alternatively, if you just fancy a ‘taster’ session we run these the first Saturday and Sunday of the Michaelmas Term for just £15, which includes full use of all our lovely kit and of course our advice and tuition. In addition, £10 is knocked off your membership fee if you join the Club before the end of October. If you want to book a Taster Session, just sign up on our Book A Taster page. So, what’s this windsurf thing all about? Our windsurfing activities range from teaching complete beginners through to taking part in international events. We have experienced wave-sailors in our ranks and several qualified instructors too. Trips include single days’ sailing, manic weekend missions, and full-on week holidays. We consistently produce good results on the university circuit. Off the water, we are even stronger. No-one we know parties quite as hard as us. We view the social side of windsurfing just as importantly as the sailing side, as it brings the Club together and makes everything more fun. I’ve never windsurfed before. How can I take part? Many of our members have never windsurfed before. It’s a great sport to learn with a very fast and satisfying learning curve. We often run special beginners trips with experienced sailors doing the teaching. There will also be lots of people of the same standard as you, so you can learn from and laugh at them as well. I’ve been windsurfing for years. Is the club advanced enough for me? Yes. We have several keen wave-sailors who are never afraid to break a few bits of kit in the search for a new move. But if you know how to forward loop, then can you teach me? Seriously, however, we do encourage experienced sailors to help with the teaching of the beginners – it’s good for a laugh and gives you something to do when it’s not windy. Do you just windsurf – what about parties? What! I can’t believe you’re asking. We have the most legendary pub evenings known to mankind. As well as swaps and curries, there’s the great times we have when we have a weekend away with the other universities. It sounds expensive. How much is it? It costs £50 for a complete year’s membership, which also allows you to participate in CUCrC kitesurfing, dinghy sailing, and team racing. This may sound expensive, but when you think it includes membership of Grafham Water SC, complete use of the Club’s kit (which can cater for almost every need), and use of the warm Club wetsuits. You will never again windsurf as cheaply. You also get us organising and driving you to great windsurfing locations. As already mentioned, we run Taster Sessions for £15 on the first Saturday and Sunday of the Michaelmas Term and £10 is knocked off your membership fee if you join the Club before the end of October. If you want to join the Club or book a Taster Session, just sign up on our Join The Club or Book A Taster pages. Beyond the membership fees, the only essential costs are for food, drink, travel and event entry fees. All the events are very cheap, and are a great chance to escape from Cambridge. The Club aims to refund a proportion of the entry fees that windsurfers incur during the year, and there is a small Hardship Fund for special cases of difficulty. If you get keen, you may want to purchase some wetsuit boots or a wetsuit. This is still not too expensive, and the Club sometimes arranges some bulk buy deals for all you lucky people. Okay then, I’m hooked. How do I join? As already suggested, come and meet us at the Freshers Fair at the Kelsey Kerridge sports centre and Parkers Piece. We’ll be the people eating pizza, drinking beer and accosting all the good looking girls and blokes – underneath the CUCrC burgee banner or by the board and rig on Parkers Piece. If you miss us there, then come along to the CUCrC Squash, where we’ll give you lots of free alcohol – yes, free alcohol! – and use various encouraging tactics to get you to join. Otherwise sign up for membership on our Join The Club page. You’re putting questions in my mouth. How can I ask my own question? Easy – if you missed asking it at the Freshers Fair or Squash. Just email the Committee (see the Club Officers page). The Vice Commodore / Team Captain will usually be able to help the most or know who to ask.